Although the average dog is about 25% smaller than their wild ancestor, the grey wolf, it appears based upon some recent research in Denmark that domestic cats have become 16% larger over the past 2000 years beginning with the Vikings. Although I am generalising because the study was done in Denmark and it may not relate to domestic cats in other countries and other parts of the world. Domestic cats have got 16 percent larger in Denmark over 2000 years since Vikings. Photo (added to by me) by ANNE-BIRGITTE GITFREDSEN. An undergraduate at the University of Copenhagen, Julie Bitz-Thorsen, was asked by her supervisor to sift through bags of bones taken from archaeological sites across Denmark. The bags contained the bones of various animals over the past 2000 years. 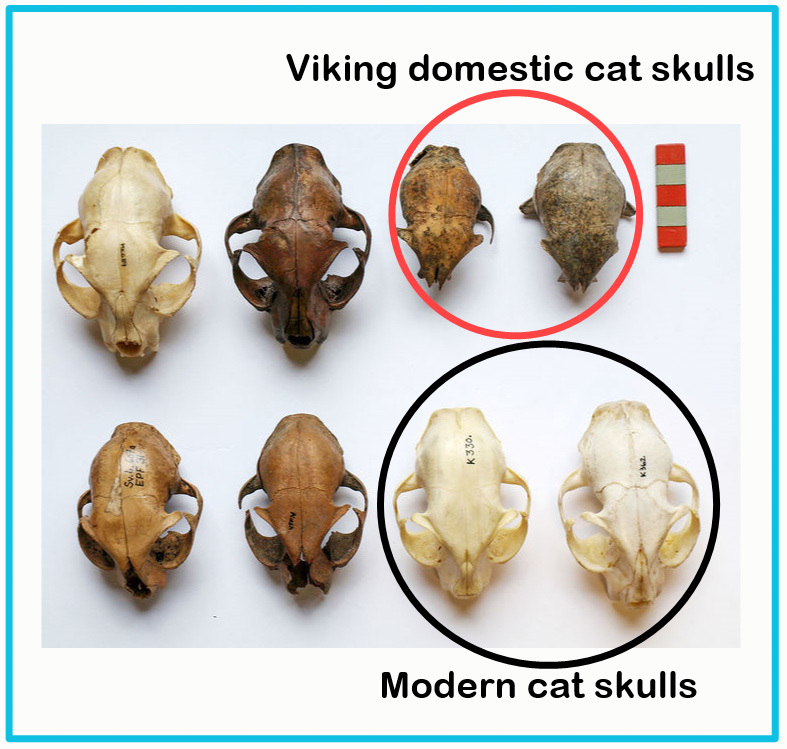 The sciencemag.org website tells us that by 200 CE (same as the AD and BC system) Danish citizens were keeping cats. This was the Iron Age in Denmark. Vikings were farmers as well as seafarers and it seems that they kept cats for both pest control and for their fur. The bones that Bitz-Thorsen went through came from the Geological Museum in Copenhagen. As mentioned they covered 2000 years beginning with the late Bronze Age and ending in the 1600s. Many of the bones came from the carcasses of animals killed by Vikings for their fur. There were marks on the bones to indicate this. The bones were carefully measured with an electronic caliper. The dimensions were compared with modern Danish cats from the period 1870 to the present. It was discovered that on average domestic cats became 16% larger between the Viking Age and today. This has been reported in the Danish Journal of Archaeology. As mentioned, and as you can see, the research only relates to Danish cats. However, the conclusion appears to be supported by a study in Germany in 1987 which found that domestic cats of the mediaeval age were smaller than the modern day variants. Why the change in size? This begs the question as to why the size increased occurred. The current thinking is that the cats had greater access to food than previously. They speculate that during mediaeval times population growth led to expanding towns which attracted more pests which in turn provided cats with better nourishment which in turn boosted the numbers. Of course at that time all domestic cats were probably better described as semi-domesticated and indoor/outdoor cats. Indeed many of them would have been community cats. Also, it is speculated that from the late Middle Ages to today cats became more popular and were therefore fed better. This meant there was less need for cats to find food which meant they burned less energy. A question mark exists as to whether there has been an evolutionary change in their genes which makes them larger. My mind turns to the Australian feral cat. The experts on that continent say that their feral cats have become super-sized due to an abundance of wildlife to prey upon. If that is true there is a similarity between the narrative concerning the Danish domestic cats. P.S. the photograph indicates a greater than 16% increase in size but I am not clear why this is. This entry was posted in size and tagged cat history, domestic cat size by Michael Broad. Bookmark the permalink.